Sixt has numerous locations offering car rental in Paris where you can begin your exploration of one of the world's most captivating cities. No matter what your trip to the City of Lights entails, our car rental deals in Paris can help make your plans possible. Fly in and pick up your rental vehicle from our Paris Charles de Gaulle (CDG) or Paris Orly Airport car rental locations, or arrange to collect at one of our train station rental car locations including Gare du Nord and Montparnasse. With our affordable rates and premium rental cars we make it easy for you to rent a car in Paris and tour its iconic sites and surrounds. Our well-placed Paris airport and city car rental locations give you an opportunity to start your trip from just about anywhere in the city. Rent a car in La Défense and have quick access to the major business district of Paris, or be right in the center near top attractions like the Notre-Dame Cathedral when renting a car at our Paris Rivoli Sebastopol branch. Some of our Paris branches offer special services, like 24 hour pick up or return. The City of Lights sparkles in the winter, making a trip to Paris a great idea. You can visit the Louvre and Notre Dame without so many people in line. Walk the Champs Elysee to see the Christmas lights or visit the Galeries Lafayette department store in December to see the Christmas display. The city has the largest Chinatown in Europe and if there during the Chinese New Year, be sure to check out a parade. Christmas markets are becoming more popular in the city and you can normally find them in La Défense and on the Champs Elysée as well as in Montmartre and Saint Germain. With your rental car you can easily get to Disneyland Paris where they have yearly Christmas events. A premium sedan is perfect for visiting Paris in winter, and be sure to ask about winter tire availability. Our car rental deals in Paris allow you to choose from a variety of luxury and economy car rentals. You can rent a car with automatic transmission and even request a hybrid. Book online and have the chance to do a price comparison between the models available for your dates. While making your reservation you can include useful add-ons and extras to your car rental like unlimited kilometers. GPS, additional drivers, coverage protections and child seats are some of our other recommended optional features. What kind of car rental is best for a trip to Paris? The Sixt fleet hosts a diverse range of latest model vehicles from top brands like Mercedes-Benz and BMW. Whether on a family vacation or a business trip we can accommodate your mobility needs with our wide selection. You can also arrange a one way car rental in Paris and have more flexibility with your travel plans. Below are some of the car categories available at our Paris car rental locations. Doing business in Paris or need to transport goods? With Sixt you can rent a van or truck to help you haul it all. Several of our train station and downtown branches offer a selection of larger vans and trucks to rent for personal and commercial use. Let us help you take care of your transportation tasks with our reliable van and truck rentals in Paris. Where to park in Paris? Parking in Paris, especially in the main metro area can be a challenge. You can park your car rental either on the street or find an underground parking garage. However, both can be expensive so you might want to park in a cheaper, peripheral arrondissement rather than the city center. For example in the center you might pay 5 euro for 2 hours while further out an entire day might cost only 10 euro. Paris is hardly a city that needs any introduction as it is one of the most iconic metropolises in the world. 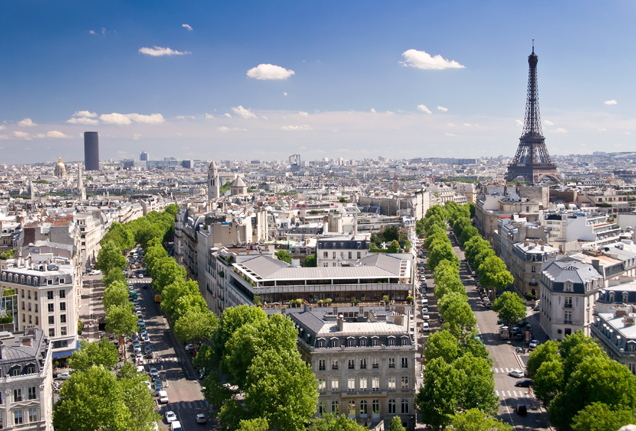 Famous for being a fashion capital, home to some of the finest cuisine and works of art and of course, the Eiffel Tower. Each of its arrondissements have their own character and charm from upscale, style conscious crowds to more arty bohemian vibes and everything in between. For us, we think a trip to Paris is not complete without stops in Montmarte, the Clignancourt Flea Market in St-Ouen, and of course, the Louvre museum. When you have finally visited all the best attractions in Paris, take a road trip to nearby destinations such as the Palace of Versailles. Just to the east of Paris in Marne-la-Valée is the popular Disneyland Paris. You can rent a car in Paris and arrive at Disneyland Paris in less than an hour driving on the A4. Home to two theme parks, resort hotels, shopping and dining, entertainment and a golf course there is plenty to do for a day, weekend or longer. Guests staying at one of the on-site hotels can typically park their car free of charge, day visitors should expect to pay about 20 euro.